In the dead of night, April awakens from a nightmare where she saw herself as a mutant turtle being chased by ninja. Even though the nightmare was weird, she considers that her reality is much weirder. 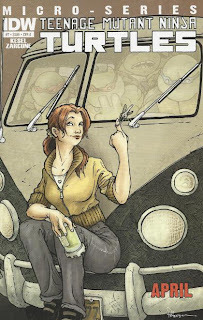 Later that day, April takes her four Ninja Turtle buddies for a drive in her van. Don is concerned about Stockman’s “Turtle Tracker”; that he may try to build another one. Raph and Mikey tell him to relax and April drops the four off at some warehouse. Returning to work at Stockgen, April contemplates that she is aware of the company’s illegal activities, but doesn’t want to divorce herself from the place until she’s formulated a plan and made as much use of her access as possible. Thinking analytically, she begins to conceive that plan and pockets a security card from a careless coworker. She then sees Chet nervously guarding what looks just like the Turtle Tracker Donatello described to her. Using the moves Casey taught her, she maneuvers Chet into spilling coffee on some equipment; the resultant power surge shutting off the lights. In the chaos, April stashes the Turtle Tracker in a case to retrieve later. On another level of the building, a tank containing a three-fingered experiment fails due to the surge and the experiment-itself awakens. Back at the 2nd Time Around Shop, April tells the Turtles that Stockgen has built another Turtle Tracker and that only she can retrieve it. The Turtles are reluctant to let her go alone, but concede they have no choice but to trust her resourcefulness. Disguising herself and sneaking into the secure sectors with her stolen pass card, she spots Chet having a discussion with one of the Stone Warriors and grows ever more suspicious. She retrieves the Turtle Tracker from its hiding place, but the Stone Warrior notices she isn’t supposed to be in the sector and confronts her. April runs to hide in a top secret lab, passing by the failed experiment cylinder that now looks like its contents have escaped. April also passes by several vials of glowing green ooze and pockets one. The Stone Warrior catches up with her and April has to think quickly to escape. Dislodging an exhaust hose, she blasts the Stone Warrior with smoke and makes a break for it. The Stone Warrior is about to give chase, when the rather spiky escaped experiment beats him to a pulp. As security teams scramble, April hides out in a hazmat suit and sneaks away. The experiment passes through the main research area, noticing an old turtle terrarium (the one the TMNT came from). The experiment clutches a small plastic palm tree and strokes it affectionately. Several guards approach the creature and it takes them all down. Escaping into the parking lot, April realizes that she no longer feels afraid when confronted with danger like she used to. Being a scientist, though, she does feel disenfranchised that corporate research facilities operate such unethical, secret agendas. Smashing its way through the exit, the experiment, a spiky mutant turtle with one green eye and one yellow eye, makes its escape into the night. *This story is continued from TMNT (IDW) #14. The story continues in TMNT (IDW) #15. *The editorial note says that this issue takes place between TMNT (IDW) #12 and TMNT (IDW) #13. According to editor Bobby Curnow, that was a mistake and the issue takes place between TMNT (IDW) #14 and TMNT (IDW) #15. *Stockman built the first Turtle Tracker in TMNT Micro-Series #3: Donatello. *The mutants contained in the other pods will be revealed in TMNT: Bebop & Rocksteady Destroy Everything! #3. *This issue was originally published with 3 variant covers: Cover A by David Peterson, Cover B by Zarcone and Cover RI sketch variant by Peterson. Well, the fact that I opened my review swooning over the long overdue return of one of the franchise’s fan-favorite villains might pose a potential problem. This was “Microseries: April”, not “Microseries: Slash”, after all. Still, as an April O’Neil spotlight, this installment in the TMNT Microseries gets the basics of her character down pat. April’s a very tough character to keep interesting and most of the franchise spin-offs beyond the Mirage comics have had to make alterations to keep her from fading away (as she ultimately did in Mirage). The Fred Wolf cartoon had to make her a news reporter to keep her involved in the action, the Archie comic followed suit and then made her a ninja as well so she could actually participate in said action. The 4Kids cartoon first made her a techy so she could work behind the scenes, then made her a ninja so she could hold her own in battle. Heck, even Mirage, during TMNT Vol. 4, had to jump through hoops to make April interesting… though that book went the rather controversial route of making her a magic doodle brought to life. Points for imagination, I guess. IDW’s April has yet to really strut her stuff. The entire first year of storytelling essentially covered a decompressed version of the origin, which is where April is at her most interesting/iconic (the rescue, the fainting, etc). Now that the origin is behind us, it remains to be seen how IDW will keep April from dissolving into the scenery. They seem to be going in the direction of making her a fighter and a techy, ala the 4Kids series, with her already illustrating her intellect and Casey giving her self-defense lessons so she can keep up with the gang. If there’s one thing I like about the decompressed approach to storytelling, it’s that April hasn’t become a ninja on par with the TMNT overnight, which is how both TMNT Adventures and the 4Kids series handled it (one afternoon of training from Splinter and suddenly she could vertically leap eight feet in the air and outfight trained assassins). Her progress has been steady and believable; even her infiltration of Stockgen focuses less on the physical aspects of her training but the stealth and tactical qualities; qualities that come easier to her analytical mind. Writer Barbara Randall Kesel illustrates a strong understanding of April’s character and I like the way she favors the more technically savvy aspects to her. 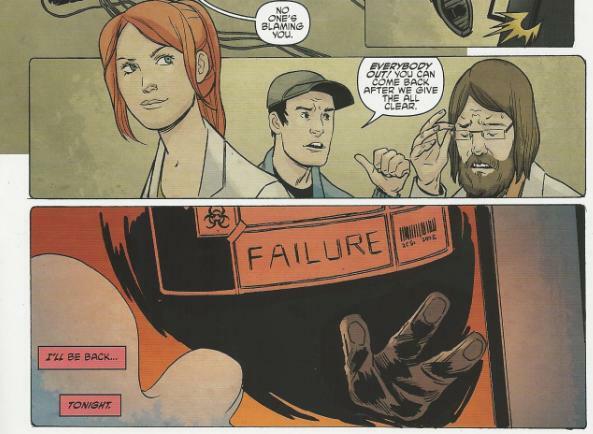 Her talents as a computer programmer went mostly unutilized in the Mirage series, while the 4Kids cartoon made her into a generic “hacker” of vague skill level. Here, Kesel gives us a look inside her head and shows us how she sees the world, manipulating and adapting the lessons she’s learned to suit her strengths. I definitely prefer the approach of making April a resourceful infiltration expert (or getting there, anyway) over having her slam her fingers down on a keyboard for thirteen seconds and “oh hey, I hacked the interwebs!” This April actually displays that she’s genuinely intelligent, a quality that up until now we’ve always been told April possesses rather than convincingly shown. Unfortunately, April’s still… kind of boring. It’s not really anybody’s fault; April is supposed to be the logical cornerstone of the universe; the straight-woman, so to speak. So when she has to play wet blanket to a host of strong, diverse, bizarre personalities, it’s small wonder that she seems a tad milquetoast by comparison. Sort of like how writers have a hard time making Winston in various Ghostbusters stories interesting, as he has to be played as the "down to earth everyman". And that sort of character just pales when placed next to an overly exuberant man-child, an emotionally barren super genious and a sarcastic career slacker. April is the Winston of the TMNT universe. And that, essentially, is why Slash succeeds in stealing her own Microseries from her. Because a cool-under-pressure, scientifically-minded, resourceful redhead just can’t compete with a psychotic, palm tree-obsessed, spiky mutant turtle on the rampage. On the subject of Slash: I am psyched. 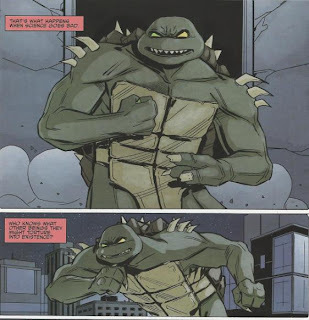 There have been many attempts to create Evil Turtles for the TMNT to fight (Tokka, the Dark Turtles) and yet Slash is the one people clamor for the most. Exactly why, I have my theories, but I want to save that for the subject of another article, so I won’t go into them now. I’ll just say that it’s great to have him back when he hasn’t been in a story since 1994. Marley Zarcone’s art is solid. I liked the Mona Lisa homage to reptile-April during the opening nightmare (I called her a turtle in the summary, but she lacks a shell). While I wouldn’t call Zarcone’s style the most remarkable we’ve gotten in the book so far, it’s still pretty dynamic and really shines during the action sequences (April’s confrontation with the Stone Warrior was great). It’s more the “dull” sequences that Zarcone falters on; the characters sitting around chatting. Zarcone doesn’t really do much with the angles or layouts to try and make those lengthy “talking head” scenes pop. Heather Breckel’s coloring is pretty great, too; again, really looking wonderful during the scenes in the experiment lab. Anyway: Slash. I can’t freakin’ wait. That's why they call him SLAAASHHHHH!!! YES! Ya know, I never would have thought about the Mona Lisa homage on the first page, but you might be right about that. I need to ask Marley whether she based that visual image more on Mona or on that Archie Special #11 where April turned into a turtle. Sounds like this book just keeps getting better all the time. Glad I'm not the only one who noticed that April didn't have a shell in the opening, which is odd because she clearly looked like she was rocking a plastron. I'd shy away from the Mona Lisa homage as she didn't have a tail either. Still it was a great way to start the issue out and it gets the April as a Turtle thing out of the way nice and early for the IDW universe. I have to agree that April was kind of overshadowed in the book. 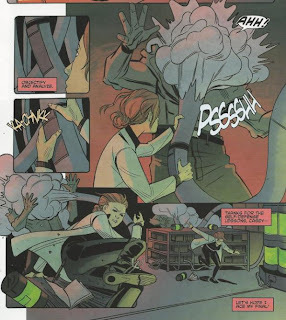 It was great to see her get some actual characterization in the IDW univserse, but it felt like she could have just as easily been out shopping for food as infilitrating the lab and have had a similar inner monologue. There was just too much separation between the two, which unfortunately made them just feel like filer until the next hint to Slash. Still she came across intelligent and competent which its great to see in her character. I hope that we get to see more of it. Though I think just taking the Tracker as opposed to locking it in a safe would have been easier, but she is still new to this whole spy thing.